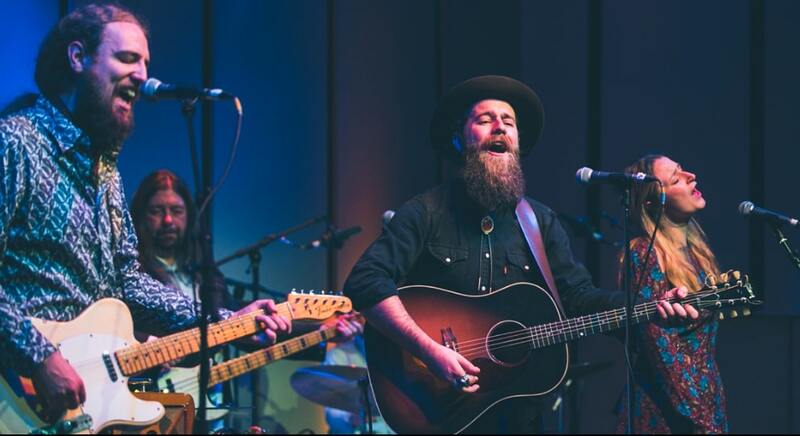 Liverpool-based blues, ballads and broadsides band Seafoam Green are back in town after a US tour in support of their debut album. How to celebrate your homecoming? Throw a big party in the main hall of the Phil’ and invite your famous friends to recreate ‘The Last Waltz’. By Alan O’Hare. I’ve had a year of The Band. Ever since Robbie Robertson released his autobiography ‘Testimony’, late in 2016, the seminal rock ‘n’ rollers have dominated my musical thoughts. First, I followed Robertson’s revealing read up with Barney Hoskyns‘ brilliant ‘Across The Great Divide’, and then I found myself in possession of an updated take on Levon Helm’s 1993 torn and tattered tome, ‘This Wheel’s On Fire’ (Levon’s is the best, in case you were wondering). All the while, I was revisiting the soundtracks to the stories I was reading about and found hidden delights in some of the more less-known corners (ie. not the first two records) of The Band’s oeuvre: ‘Rock Of Ages’, ‘Moondog Matinee’ and ‘Jericho’. Still, lovers of Bob Dylan’s best ever backing band always come back to ‘… Big Pink’, ‘The Band’ and ‘The Last Waltz’. The latter, in particular, attaining mythic status over the years with fans willing to forgive such letdowns as obvious overdubs and constant repackaging. It’s the music that endures, though, and with ‘album tours’, reunion concerts and themed gigs being de rigueur right now, Liverpool-based Seafoam Green made the grand decision a few years ago to honor said fitful night every twelve months with a recreation. In 2018, the event has moved into the main room of the Phil’ and it’s going to be no mean feat to pull a crowd of 1976’ers into the Hope Street hall. Fortunately, Seafoam Green have the chops and, fresh from a US tour, they’ve invited friends such as Phil Campbell (The Temperance Movement), Nick Ellis, Xander & The Peace Pirates, Dan Wilson (The Cubical), Connie Lush and Robert Vincent to help take the load off.